Used a serrated blade to chop the semi-sweet chocolate and set it aside. Chop and weigh the white chocolate and place that into a separate container with the peppermint chocolate Chipits. 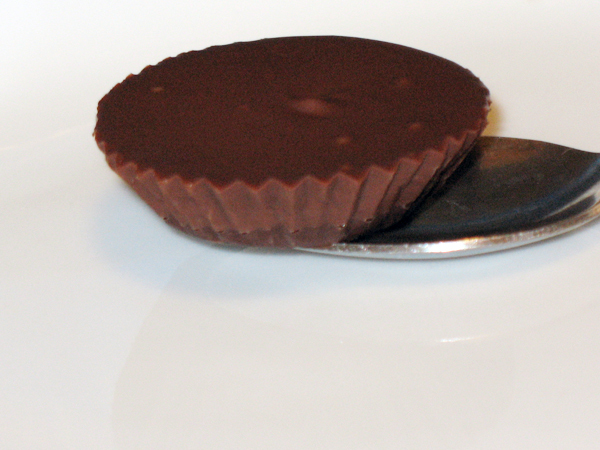 Transfer semi-sweet chocolate to microwave-safe bowls. Microwave the semi-sweet for 2.5 minutes, stirring every 30 seconds. Spoon the chocolate into the mini muffin liners. Gently shake each cup so the chocolate settles smoothly. Melt the white chocolate and peppermint Chipits on High for 3.5 minutes, stirring every 30 seconds. Stir until evenly combined. Spoon melted mixture on top of chilled cups.